CORTE MADERA, Calif.--(BUSINESS WIRE)--Oct. 31, 2016-- RH (Restoration Hardware Holdings, Inc. – NYSE: RH) announced today the opening of RH Las Vegas, The Gallery at Tivoli Village at 340 South Rampart Boulevard. RH Las Vegas represents the latest iteration of the brand’s next-generation design galleries. Commanding four levels and 60,000 square feet, this innovative new retail experience features artistic installations of home furnishings in a gallery setting – including an entire floor dedicated to RH Modern with an integrated RH Contemporary Art Gallery. RH Las Vegas also includes an interactive Design Atelier, a professional workspace that allows customers, designers, and architects to conceptualize and customize a home. “Our vision with RH Las Vegas is to reimagine the retail experience by blurring the lines between residential and retail, indoors and outdoors, physical and digital – creating an environment that is more home than store,” says RH Chairman & CEO Gary Friedman. RH Las Vegas marks Friedman’s ongoing collaboration with design architect James Gillam of Backen, Gillam & Kroeger, a firm recognized as one of Architectural Digest’s Top 100 architect and design firms in the world. Conceptualized as a grand-scale, classical contemporary structure filled with fresh air and natural light, RH Las Vegas features a charcoal-grey Venetian plaster exterior with an expanse of glass-and-steel French doors that open onto a streetscape defined by towering silver date palms and garden walls lush with fig ivy. Looking overhead, guests will admire Juliet balconies, an expansive garden terrace on level three and a Rooftop Park & Conservatory with mature heritage olive trees. As night falls, the building is transformed through dramatic illumination, highlighting its architectural details and landscaping. Visitors arriving to the Gallery from the west will pass through a dramatic tripartite entrance – a series of three glass-and-steel arches towering 30 feet overhead – flanked by decomposed granite courtyards complete with Italian cypress, Mediterranean olive trees and the sound of trickling fountains. 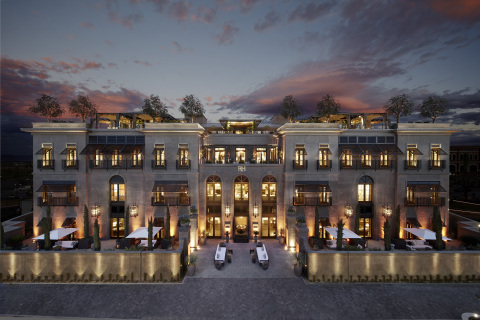 Guests will then continue into a central hall with soaring 12-foot ceilings and a cast-stone Tuscan colonnade. Along the periphery, Palladian-inspired arched passageways lead to a classical arrangement of rooms with artistic lifestyle installations featuring RH Interiors collections from internationally renowned designers. Arriving via the Gallery’s north and south entrances, visitors will enter through striking, nine-foot steel gates into decomposed granite garden courtyards complete with geometric topiaries, foxtail agave and exotic succulents. Once indoors, they will enjoy unobstructed views across the entire main level to the corresponding courtyard beyond. Continuing their journey to the upper floors, guests will ascend a grand double floating staircase awash in natural light via massive, 40-foot walls of glass and steel. A spectacular installation of 24 Helix crystal chandeliers hanging 64 feet overhead highlights a composition of gilded antique mirrors cascading down the stairwell to create an endless reflection and further illuminate the way. Level two features RH Design Atelier – a 4,000-square-foot studio anchored by four, 10-foot custom tables offering a fully integrated workspace for customers, designers and architects to reimagine one room or an entire home, inside and out. Here, guests can work with a highly experienced team trained in the RH design ethos to create functional and elegant spaces. A place for collaboration and ideation, RH Design Atelier features access to RH’s vast library of fabrics, leathers, and furniture and lighting finishes – providing an unprecedented level of design services. “With the introduction of RH Interior Design, we have now moved the brand beyond creating and selling product to conceptualizing and selling spaces,” says Mr. Friedman. Additional RH Design Atelier resources include a Ben Soleimani rug showroom displaying the fourth-generation designer’s hand-knotted and hand-woven rugs, and other specialized galleries for window treatments, bed and bath linens and bath hardware. On the third level, guests will discover a 17,000-square-foot exhibition space presenting RH Modern, one of the largest curated and fully-integrated assortments of modern furnishings, lighting and décor under one brand in the world. Developed in collaboration with a select group of acclaimed global designers, RH Modern’s design vernacular represents a fresh and innovative point of view, defined by a minimalist aesthetic, the finest materials and maximum comfort. This immersive space incorporates RH Contemporary Art – offering a curated and engaging collection of artwork across all media – along with an expansive garden terrace punctuated by striking crystal and iron chandeliers, and a tracery metal trellis accented with white Chinese climbing rose. At the top of the grand stair, visitors will arrive at the Rooftop Park & Conservatory. This 16,000-square-foot garden space will first be experienced within a structure of glass, wood and steel with towering banana palms and 16-foot ceilings at its apex. The indoor space opens onto the spectacular rooftop with mature heritage olive trees surrounded by decomposed granite and set within colossal steel planters accented with cascading rosemary. This one-of-a-kind destination features a beautiful center trellis, billowing shade canopies, glimmering chandeliers, trickling fountains, sculptural evergreens and fragrant lavender that further enhance a dramatic display of the latest RH Outdoor furnishings and frame stunning views of Red Rock Canyon. RH Las Vegas, The Gallery at Tivoli Village offers valet parking, and can be reached at 775.464.0770. Hours of operation are Monday through Saturday from 10am to 8pm, and Sunday 11am until 6pm. RH (Restoration Hardware Holdings, Inc. - NYSE: RH) is a curator of design, taste and style in the luxury lifestyle market. The Company offers collections through its retail galleries, source books and online at RH.com, RHModern.com and Waterworks.com. This release contains forward-looking statements within the meaning of the federal securities laws, including statements related to the customer experience when visiting RH Las Vegas, The Gallery at Tivoli Village, the presentation and layout of RH Las Vegas, and the Company’s merchandise and business offerings within this location, including RH Modern, RH Contemporary Art, RH Design Atelier, RH Interior Design, the Rooftop Park & Conservatory and RH Outdoor. You can identify forward-looking statements by the fact that they do not relate strictly to historical or current facts. We cannot assure you that future developments affecting us will be those that we have anticipated. Important risks and uncertainties that could cause actual results to differ materially from our expectations include, among others, risks related to the number of new business initiatives we are undertaking; our ability to introduce new products and merchandise categories that will be of interest to our customers and to new customers; as well as those risks and uncertainties disclosed under the sections entitled “Risk Factors” and “Management’s Discussion and Analysis of Financial Condition and Results of Operations” in Restoration Hardware Holdings’ most recently filed Annual Report on Form 10-K filed with the Securities and Exchange Commission, and similar disclosures in subsequent reports filed with the SEC, which are available on our investor relations website at ir.restorationhardware.com and on the SEC website at www.sec.gov. Any forward-looking statement made by us in this press release speaks only as of the date on which we make it. We undertake no obligation to publicly update any forward-looking statement, whether as a result of new information, future developments or otherwise, except as may be required by any applicable securities laws.